Global Engineering and Materials, Inc. (GEM) along with its team members, University of Dayton Research Institute (UDRI), LM Aero, and Sikorsky Aircraft, is developing a Discrete Crack Network (DCN) module in Abaqus for high fidelity static strength and fatigue life prediction in bolted composite structures. The DCN is formulated by combining mesh independent matrix cracking with interface delamination modeling. The toolkit is developed under the sponsorship of NAVAIR, the Air Force Research Laboratory, and NASA. DCN can be used to predict the discrete damage evolution associated with matrix cracking and delamination of a single bolt composite joint. The stacking sequence of the carbon fiber/expoxy laminates is taken as [455/05/-455/905]s. A nominal 8mm diameter titanium alloy bolt together with a steel nut and washers were used to connect the two laminates in a single lap joint configuration as shown in the figure below. 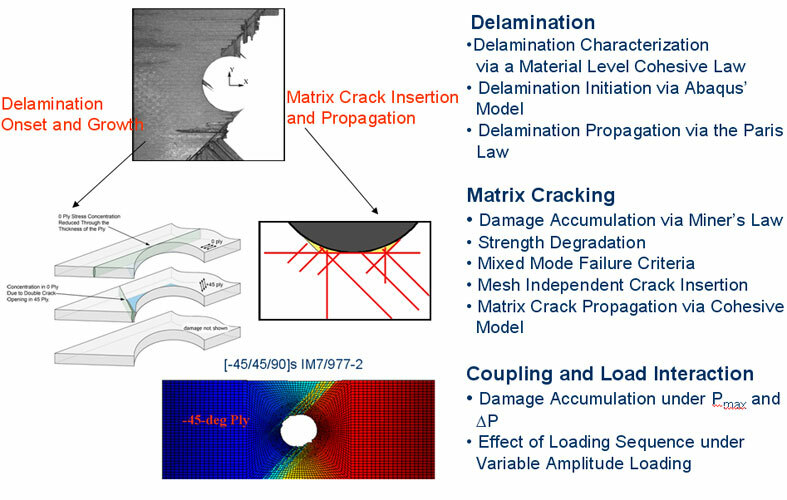 The distribution of distribution of matrix cracking and selected interface delamination is also shown in the figure.